A woman in upstate New York described the moment she gave birth to her 15 pound daughter as the same as being ‘hit by two tractor-trailers’. Baby Harper Buckley was born at Arnot Ogden Medical Centre, in Elmira, weighing in at 15 pounds and five ounces, and measuring 23.2 inches (59cm) long. 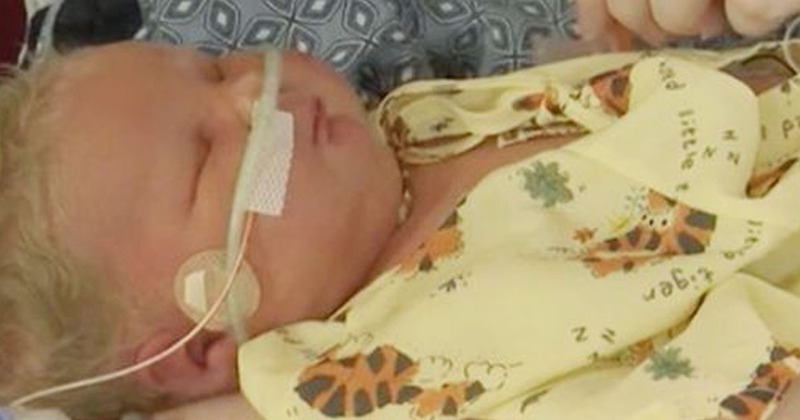 Harper is believed to be the biggest baby ever born at the hospital. It reportedly took three doctors, a medical ‘vacuum’ and a C-section to get baby Harper out, who came out the same size as most six-month-olds. Harper’s mum, Joy Buckley, had to be transferred to the neonatal intensive care unit after the procedure, though she’s now said to be recuperating well at home. I knew she was going to be big, but I didn’t anticipate no 15-pound baby. I felt like I was hit by two tractor-trailers. It was pretty violent. She got stuck under my ribcage. Joy said there was ‘enough amniotic fluid for two people. I’m up moving around, and I can walk now. I’m so relieved to be done feeling that [physical] pressure. We are so in awe of her. We’ve been able to hold her, she’s got a pretty happy demeanor. Joy and her husband, Norman, had previously been told by doctors there was a very slim chance of them naturally conceiving a child. As such, the couple adopted a baby girl. However, two years later, Joy became pregnant and gave birth to a boy, who weighed in at 11 pounds. From one big baby to seven slightly smaller ones. A 25-year-old in eastern Iraq recently gave birth to septuplets during one natural delivery. The children – six girls and one boy – as well as the mother are all said to be doing well and in good health after the epic procedure last month. Septuplets are an incredibly rare occurrence – the very first surviving set of septuplets were born in 1997 to Kenny and Bobbi McCaughey, of Des Moines, Iowa. During Bobbi’s pregnancy, the couple refused the option of undergoing a ‘selective reduction’, stating they would leave matters ‘in God’s hands’. The McCaughey septuplets were born nine weeks’ early, by caesarean section, amid intense media interest. President Bill Clinton rang the family personally to offer his congratulations, while Oprah Winfrey invited her onto her talk show. In Novemer 2018, they all celebrated their 21st birthdays.